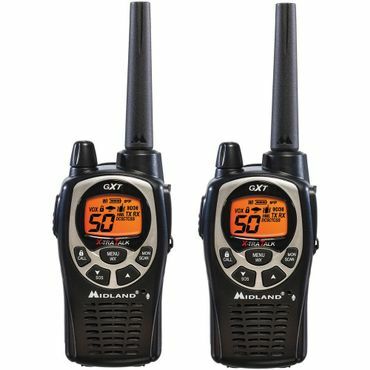 For use around the neighborhood, the woods, the work site or the shopping mall, Midland walkie-talkies get top reviews. If you're taking your radio out on the water, we found a Motorola walkie-talkie that won't leave you high and dry. We also found a budget walkie-talkie that's a good all-around performer, but is an especially good choice for kids. Reviewers find that the Midland GXT1000VP4 offers the best blend of features, durability and price. This walkie-talkie has a stated range of up to 36 miles, though users say its actual range is more like 1 to 6 miles. It's also sturdy and weatherproof, and it includes handy features like a weather radio and a highly sensitive "whisper mode." It comes in black-and-silver or black-and-yellow; a camouflage version is also available, which will appeal to hunters and other outdoor enthusiasts. If you need a truly waterproof walkie-talkie, the Motorola Talkabout T600 H2O is your best bet. It's IP67 waterproof, meaning it'll survive being submerged for up to 30 minutes at depths of up to 1 meter, so it's perfect for boating, fishing, kayaking, swimming, skiing or hunting through a heavy downpour. Of course, it includes the regular features for its price range -- NOAA weather alerts, a headset connector, belt clips, rechargeable battery and charger, and more. Despite its bargain price, the Midland LXT500VP3 boasts key features like rechargeable batteries, silent mode and keypad lock -- plus easy-to-manipulate buttons that make it an especially great choice for kids. Although it has a lower claimed range than pricier walkie-talkies (24 miles versus 36 miles), users say it seems to cover just as long a distance in real life. It's durable and backed by Midland's three-year warranty, too. It cuts costs by cutting extras: There's no weather radio, for example. Walkie-talkies can be a useful alternative to cell phones in many situations. There's no monthly contract or service fee, you don't have to worry about overage charges, and -- most importantly -- walkie-talkies (which are also called two-way radios) work in remote areas where cell phones don't. Hunters, campers, skiers, and other outdoor enthusiasts often rely on walkie-talkies for this very reason. Walkie-talkies also come in handy for families. Sending your kids out to play with a two-way radio makes it easy to check up on them or call them back in, and carrying a pair of radios can help family members keep track of each other when wandering through a mall. Many travelers use them to keep in touch with other members of their party on a cruise ship, where cell phone signals can be unreliable. Some business owners use walkie-talkies to stay in contact with workers in warehouses or at job sites. Walkie-talkies are easy to use. Most consumer models have 22 channels to choose from, covering both the FRS and GMRS frequencies. You choose a channel, push the transmit button to talk, then release the transmit button to listen. When you use a walkie-talkie, anyone listening in on the same channel can hear your conversations, and you can hear theirs. Because this overlap can interfere with transmissions, most walkie-talkies include privacy codes, which basically set up a subchannel within any given channel and filter out all other broadcasts on that channel. However, the term "privacy code" is somewhat misleading, as using them only blocks out the noise from other people's conversations; it doesn't prevent them from listening to yours. Some two-way radios have an additional voice-scrambling feature, sometimes called an "eavesdrop reducer," that garbles the signal on an FRS channel to block it from reaching other listeners. Reviewers note that not all walkie-talkies are compatible with one another; some functions -- particularly privacy features -- may not work if you're communicating with friends or family members who own different brands or models than you do. Your radio's documentation is the best guide to manufacturer/model compatibility. We looked at lots of factors when evaluating walkie-talkies for this report. First, we checked the transmission range. Since the manufacturer-specified range for a two-way radio is based on ideal conditions that are all but impossible to meet in real life, we looked at reviews from both professional testers and users to get an accurate idea of how far the radios can really reach. Next, we considered features. Some two-way radios offer few extras, while others are loaded with features like National Oceanic and Atmospheric Administration (NOAA) weather alerts, voice activation, vibration alert, texting and GPS functionality. We also read what reviewers had to say about ease of use. In general, more advanced features may require some time with the owner's manual to master, but the learning curve should not be unreasonable. Finally, we consulted reviews from owners to assess long-term durability. Reviewers consistently agree that the real range of any walkie-talkie, regardless of brand, is nowhere near the distance specified by the manufacturer. However, with every single walkie-talkie we looked at, there's considerable disagreement among reviewers about how far it can actually transmit. Invariably, some users say that their radios can send over several miles, even in wooded or hilly terrain, while others complain that they can't get a clear signal across half a mile of flat ground. It's possible that the users who complain about short radio range are restricting their transmissions to the low-powered Family Radio Service (FRS), while those who got better results are using the higher-powered General Mobile Radio Service (GMRS). Whatever the reason, it makes it difficult to get an accurate picture of a two-way radio's transmission range. In general, the best we could do was to look at whether the positive comments outnumbered the negative ones. With this caveat in mind, the walkie-talkie that generally fares the best in reviews is the Midland GXT1000VP4 (Est. $65 per pair). This model offers a wealth of features -- "silent mode" (in which it vibrates instead of beeping to alert you to pick up), "whisper mode" (you can speak in a whisper, and your listener will hear you clearly), hands-free mode, weatherproofing (light rain and accidental splashes are no problem), keypad lock (so your settings won't get accidentally changed), SOS siren and a NOAA weather radio with severe-weather alerts. It's available in black-and-silver, or black-and-yellow as the Midland GXT1030VP4 (Est. $65). Thoughtful extras include a spring-loaded belt clip (you won't have to take your belt off to put the walkie-talkie on), car charger and earpiece/microphones -- accessories that other brands charge extra for. The hunter-friendly Midland GXT1050VP4 (Est. $70 per pair) is nearly identical, but it has a camouflage case and five animal calls (turkey, duck, crow, cougar and wolf) that you can use as your alert sound. One other feature is worth noting: Midlands' "extra channels." While at first glance it seems that these and other Midland walkie-talkies have more channels than walkie-talkies from other makers, in reality, that's simply clever marketing. These channels are actually the same channels available on all other walkie-talkies, but locked to a preset privacy code. They can simplify finding an interference-free channel, but don't actually give you any additional frequencies to use. WildSnow.com's Lou Dawson awards his stamp of approval to the Midland GXT1000VP4. Dawson, a veteran mountaineer and backcountry skier, urges readers make sure every member of their party packs along a reliable walkie-talkie for safety, especially in avalanche terrain. "This Midland ... would work fine," Dawson writes. "It has the all important keypad lock, and ability to silence most stupid 'beep' noises." Owners have favored the Midland GXT1000VP4 for years -- a testament to its real-world prowess and reliability. In fact, it gets the best reviews of any walkie-talkie, period. It's a top pick among customers at Amazon.com, BHPhotoVideo.com and Walmart.com. The Midland GXT1000VP4's weakest point appears to be the rechargeable battery (it also accepts four AAs). While most reviewers say the battery life is good (10 to 12 hours with intermittent talking on its rechargeable battery), we see quite a few complaints about faulty battery packs that are weak, won't hold a charge or randomly stop working. Midland backs the radio with a three-year warranty, with 90 days for the charger, antenna, and earphones. Need a truly waterproof walkie-talkie? The Motorola Talkabout T600 H2O (Est. $100 per pair) is your best bet, whether you're boating, fishing, kayaking, swimming, skiing or hunting through a heavy downpour. It meets the IP67 standard, which means it can be submerged at depths of up to 1 meter for up to 30 minutes. It's also designed to float, face up, and there's a water activated flashlight that makes the radio easy to find after a dunk in the lake. The neon green-and-black T600 replaces -- and is very similar to -- the Motorola MS350R (Est. $80), though that walkie-talkie, which has been Dawson's favorite waterproof walkie-talkie for years, can still be found, for now, at retail. Dawson says he has tried smaller, lighter walkie-talkies, but he prefers the slightly larger Motorola walkie-talkies' longer battery life and bigger, easier-to-operate controls. The new T600 "survived my torture tests with no issues," says Michael Largent at TreelineBackpacker.com. "The body is tough, thick, and obviously designed to take a light beating while shaking off rain and dirt. All of the buttons are protected under a weatherproof cover, and the USB charge ports are located under a protective cap to prevent water from getting in." Although the T600 hasn't been around as long as the MS350R, it's started to accumulate some user reviews, including 120 at Amazon.com -- mostly favorable. About 75 percent award it 4 or a perfect 5 stars. However, we did see several complaints from owners who got lemons that either didn't work right out of the box or quickly stopped working, so buying from a retailer with a good return/exchange policy might be advisable just in case you get unlucky. Compared with the older model, the T600 adds an emergency alert button (which transmits an alert siren to other members of your group) and whistle belt clips for each radio. It also includes more call tones (20 instead of 10); you can set your walkie-talkie to transmit a specific call tone so that other members of your group will know it's you calling. Besides the waterproofing, the T600 includes several features you'd expect at this price point: NOAA weather alerts, keypad lock, vibrate setting and battery charger. However, unlike the non-waterproof Midland walkie-talkie, this waterproof Motorola charges extra for a car charger and earpiece/microphones. It does, as noted, have a built-in flashlight, which you won't find on the Midland. The T600 claims up to 35 miles of range (although, as with any walkie-talkie, you should expect only about 2 miles in real-life use) and nine hours of battery life using its rechargeable batteries (it also accepts three standard AA cells). Motorola backs its walkie-talkies and accessories with a one-year warranty. 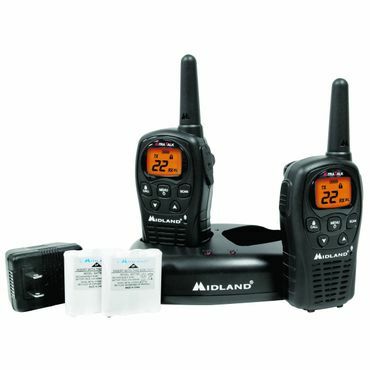 For a great bargain walkie-talkie, check out the Midland LXT500VP3 (Est. $35 per pair) -- it's an owner favorite at Walmart.com, and it's the newer version of a Field & Stream top pick (the now-discontinued Midland LXT385VP3). This budget pick has a lower claimed range than its big brother, the Midland GXT1000VP4 (24 miles versus 36 miles), but users say that this model offers as much real-world range as any other walkie-talkie. Figure on about 2 miles over flat ground, or 1/2 mile over hilly terrain. Users say the LXT500VP3 delivers clear sound at close range, even when transmitting through solid walls -- so it's a terrific budget walkie-talkie to use in malls, on building sites and on shipboard. Users also praise its long battery life; Midland doesn't specify how long the walkie-talkies will last on a single charge, but owners regularly report getting 10 to 12 hours of light use. (Actually, at this price, many users are just glad the LXT500VP3 has rechargeable batteries, period -- most cheap walkie-talkies use disposable batteries only, and burn through them fast.) However, some owners say they got lemons that wouldn't hold a charge right out of the box. Despite their low price, we didn't see many complaints about durability. 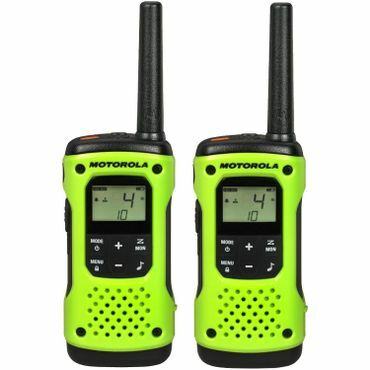 In fact, the LXT500VP3 carries the same three-year warranty as Midland's pricier walkie-talkies. It shaves costs by cutting features: There's no weather radio, no whisper mode, no hands-free mode, no SOS siren and no noise-filtering privacy codes. A car charger and earpiece/microphone are available, but they cost extra. Still, the LXT500VP3 does include the important basics: Silent mode, keypad lock, belt clips and battery charger are all included. Owners also find it quite easy to use. The Midland LXT500VP3 makes a fine walkie-talkie for kids; several parents and grandparents report that kids love this all-black, real walkie-talkie as an alternative to cheapie cartoon-character walkie-talkies. It's available in a camo version, too, as the Midland LXT535VP3 (Est. $45). Field & Stream and the backcountry skiing blog WildSnow.com make expert recommendations after putting walkie-talkies through their paces while skiing, hiking and bushwhacking. TreelineBackpacker.com conducts a similar test of the waterproof Motorola Talkabout T600 H2O. User reviews at retail websites (BHPhotoVideo.com, Amazon.com, Walmart.com and BestBuy.com) are indispensable for showing how the walkie-talkies perform in real life.